Make queuing for your Verbier ski pass a thing of the past. No need to queue at the lift station to get Verbier ski passes for you and your family. Ski Service now sells lift passes that can be picked up at the same time as your equipment. Book them in advance at www.skiservice.com and collect them at the same time as your equipment rental. You may also turn up in our shop on the main street and buy one on the spot. It takes 30 seconds. Not staying in Verbier but still want to avoid the queues? No problem. If you are not staying in the resort but instead have accommodation down in the valley, in Le Châble for example, we have a great system in place. 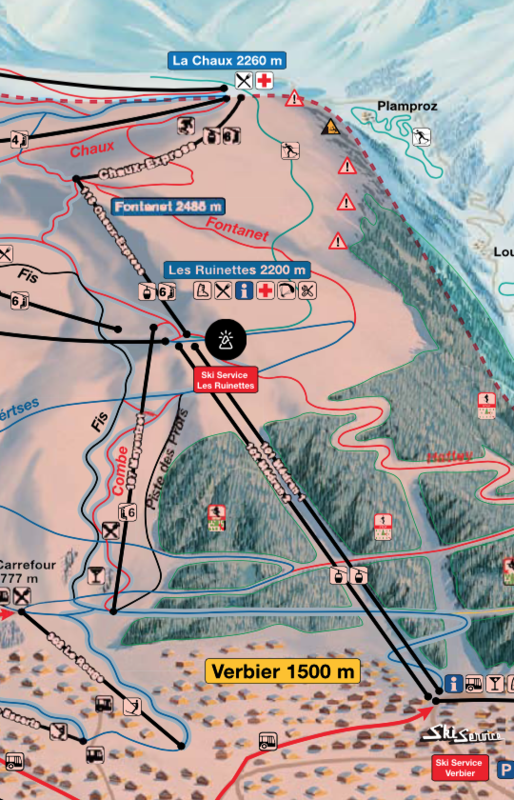 You can collect your Verbier ski pass at La Ruinette apartments, a 2 minute walk from the lift station in Le Châble. We will deliver your lift passes the day before you need them, so they are ready waiting for you. Pick them up, enjoy a free cup of coffee or a beer on us and head up the mountain to hit the slopes. Combine with Ski Service Les Ruinettes for the perfect package. This option is particularly convenient if you also want to pick your skis up at our unique mountain-top shop. Ski Service Les Ruinettes is a Verbier first, an entire ski shop located at the top of the main lift. Situated in the heart of the ski area at an altitude of 2200 meters, the shop provides ski hire, storage and equipment services. To find out the many ways in which Ski Service Les Ruinettes can make your ski holiday even better follow this link. By choosing to collect your Verbier ski pass at La Ruinette in Le Châble and your ski equipment at Ski Service Les Ruinettes, you have picked a winning combo. You avoid both the bore of queuing for a ski pass and the hassle of lugging equipment around. 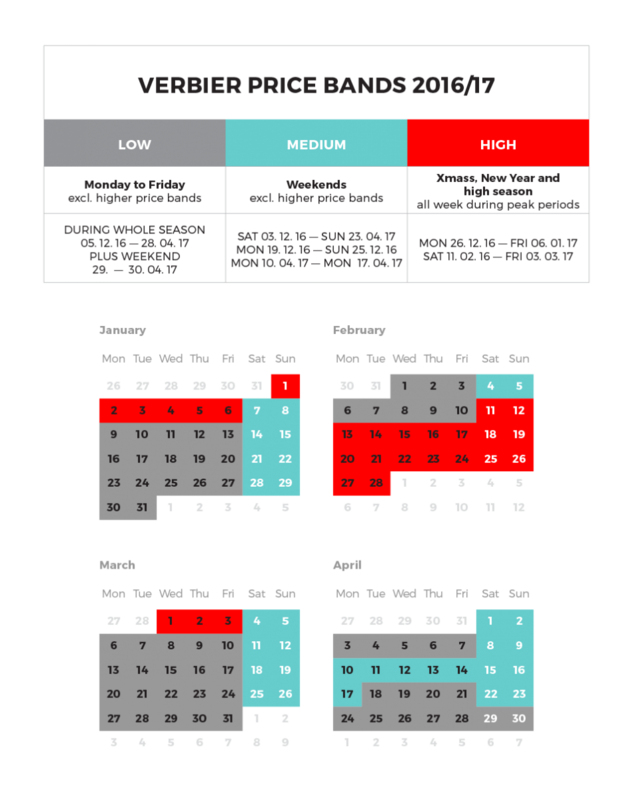 The 3 pricelists for each ski area. From 6 days onwards the Verbier ski pass includes the 4 Vallées. A minimum of three paying people, at least one adult or senior person and at least one child or young person. A maximum of three adults per child or young person. Single payment. The duration of all the ski passes must be equal, the sector can be different. 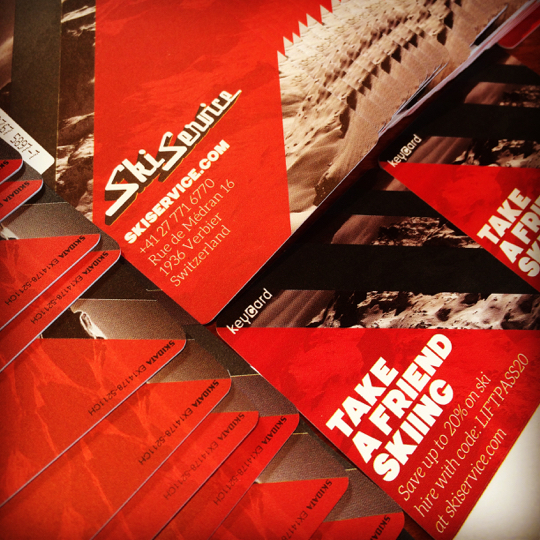 Your ski pass will come loaded onto a hands free Keycard. These cards cost 5 francs and you can resue them as many times as you like. If you already own a Keycard we recharge it, saving you the 5 franc but then you won't own one our spcially designed cards. Not only do they look awesome, they will also save 20% on your next equipment and clothing rental. SNOW Assist insurance, for both adults and children, costs CHF 5 / day and per lift pass. With insurance you will be re-imboursed the full cost of the lift pass if illness or an accident prevents you from using it. • A hands-free Keycard costs: 5 CHF and is reusable an infinite number of times. If you already have one from a previous season, bring it with you and we can load it with your new pass. • Ski passes ordered online can be collected in resort at Ski Service or we can deliver them to chalet or hotel. The collection point in Le Châble is La Ruinette appartments. • Prices shown above are for consecutive days skiing or snowboarding. 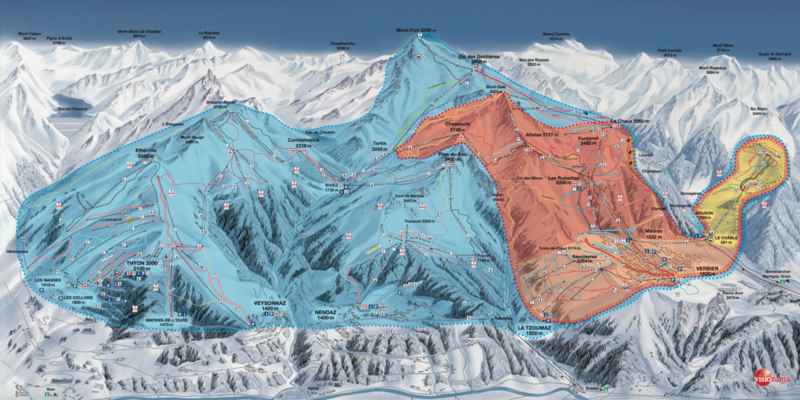 A closer look at the Verbier sector and the location of our two hire shops. 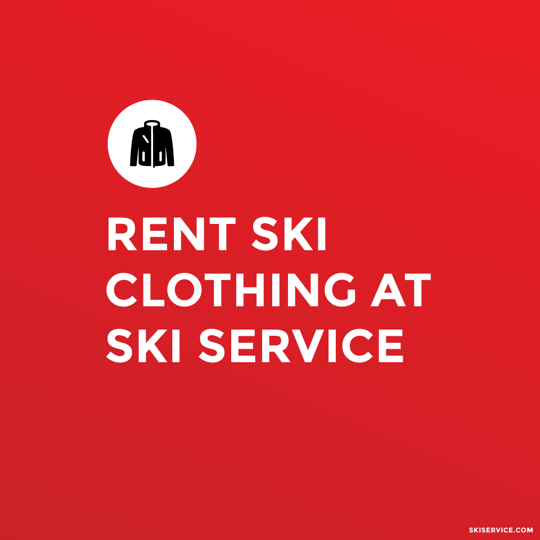 We are the first and only shop to offer Verbier ski clothing hire. You can rent The North Face jackets and pants individually or as a set just like you would a pair of skis. This could prove a particularily attractive option if its your firts time skiing or if you simply do not want pack all that stuff in your already full suit case. Available at Ski service Les Ruinettes and on demand at Ski Service Verbier. For full details on clothing hire, including prices - head to our dedicated clothing page. Ski Service online PRICE LIST.